Niché dans les milieux forestiers privés, sur un cul-de-sac, à côté du centre de ski nordique dans le Quartier Highlands et proche de toutes commodités Tahoe. Une cabane confortable et spacieuse avec parking à plat, qui offre un confort parfait pour 3 -4 familles / groupes qui aiment skier sur les meilleures pistes. Les stations les plus proches sont Alpine Meadows et Squaw mais Northstar n'est pas loin non plus. Classe mondiale vélo de montagne et des sentiers de randonnée de la cour arrière. 1 mile de Lake Tahoe. Grande vie nocturne avec NV ligne d'état à moins de vingt minutes. Cabine offre une atmosphère relaxante avec différents thèmes. Au premier étage: chambre de devant, regarder le câble / film en son surround, un feu de cheminée, et des sièges confortables. Salle à manger peut accueillir confortablement 12 personnes, à côté d'une cuisine entièrement équipée avec table de petit déjeuner. Cuisine accède à une grande terrasse en bois à l'étage avec barbecue à gaz. Au deuxième étage, l'étage inférieur comprend 5 chambres, 3. 5 salles de bains, 1 salle de jeux et un bain à remous avec des jets puissants. Salle de jeux avec table de billard / Xbox et Kinects / son surround pour la télévision par câble / Blu Ray. Mots-clés: Tahoe City, Squaw Valley, Centre de ski nordique, le lac et les équipements de navigation de plaisance. Accepte les familles et les groupes. Un chien bien élevé sera acceptée. Nous avons jeu de fer dans la cour. The home is large and spacious for multiple families/large groups. We had plenty of room for adults to converse while the kids played. Kitchen was well equipped with dishes/utensils. Huge crack in coffee pot so we were not able to use it. Description say's " extra parking area that could hold a boat". There were two RV's parked in the "extra parking"
The BIGGEST CONCERN...Signs stating that we could not put ANY toilet paper down the toilet due to old pipes and that it must be put in the trash. This was NOT stated in any description of the home or any correspondence with owner. This would have been a deal breaker for us. We were only given a couple of trash bags for kitchen so we had to go out and purchase our own. Thank you Trudi for taking the time to write a review. I am glad you found the house comfortable, well equipped and spacious. It is really a great house for large groups. I am sorry that the coffee pot was cracked and appreciate your letting me know as I have replaced it and we now have a brand new coffee maker for our future guests. It is possible to park on the street in our neighborhood and because we are at a cul de sac there is plenty of parking. As for the toilet paper issue we do have toilets that can easily get clogged so therefore I am overly cautious but a small amount of toilet paper in the toilets are fine and will let future guests know this and add it to the home instructions so that folks are cautious and careful with the amount of TP they playe in the toilets. Thank you again for staying at our home. This house was exactly as advertised- Large, functional, and near Dollar Point. The hot tub worked great. Great trail access to the Tahoe Cross Country Ski Trails and Tahoe Rim Trail. The owner, Sheila, was very responsive and helpful. 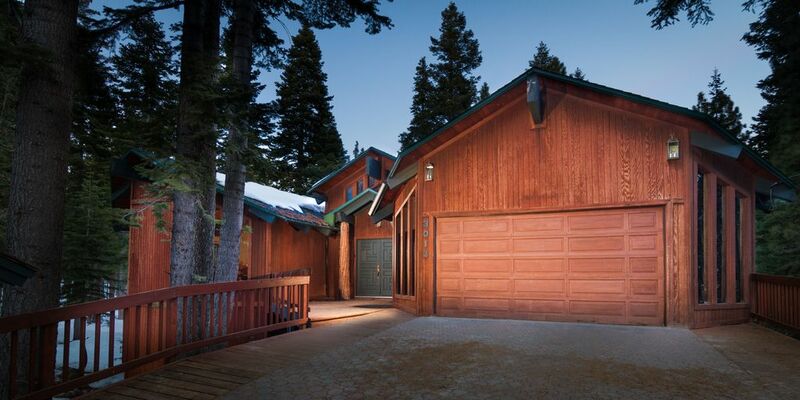 I hope you consider our home for your next family or friend gathering in the Lake Tahoe area. As our guest said we are very conveniently located only 5 minutes from charming downtown Tahoe City which has restaurants and shops and about 1 1/2 miles from Dollar Point beaches. The trails are literally outside our front and back doors. And our home has a lot of communal space along with the 5 bedrooms so your group will be very comfortable and will have room to be alone or together. We also do allow well behaved pets. We so enjoyed our stay in Tahoe City. The local area affords much to do. The house was perfect for our group of 9 staying over as well as additions of a few Thanksgiving Day orphans for dinner. Everyone enjoyed being in the kitchen to help with meal preparation and/or just relaxing and playing games and pool. The property was very clean and well maintained which allowed us time to just have fun. Thank you so much for the nice review. We are so happy that you enjoyed the Tahoe area and that our home allowed you to have a relaxing Thanksgiving with your family and friends. Fantastic home. Great location. Quiet neighborhood . Thank you for your nice review. I am so glad you enjoyed our home and your stay in the beautiful Lake Tahoe area. The listing for the Highlands Drive property on line was very accurate in its description of location, layout, amenities, user instructions, etc. We rented two houses in the Highlands for a family reunion that included a total of 28 people. We easily accommodated 16 of those people at this house. The property was clean, well-maintained, and welcoming. The person handling the spa and the cleaning crew were very pleasant. We are seriously thinking about going back to this unit again for another reunion or smaller gathering. The unit was set up to handle all 28 people for dinner one night in the dining, deck, kitchen, and living area. The kitchen was set up to easily handle the prep work for such a meal. The pool room was the big attraction inside the house, while the easy access to mountain biking and the paved bike trail along Highway 28 was the big attraction outside. We visited Meek's Bay beach a couple times and also went to Sand Harbor, both great beaches. Because of construction, the trips were about a half hour away. The setting in the woods was great with an easy path to the other house on Cedarwood Drive. I understand from the cleaning crew that the owners are contemplating some upgrades in the near future, which should make it even more appealing. It was a great stay. Thank you for your review. I am so glad that you and your group enjoyed our house and the Tahoe area. We hope you do indeed come back and stay with us again. Our group of 12 was up in Tahoe for a race and to get away from the city for a weekend. The layout is perfect for a group this size, with all the living spaces upstairs, and the bedrooms/gameroom downstairs. We cooked great big meals, and had several people working in the kitchen at once, and when we sat down to eat, we had the option of sitting at the formal dining room table, the eat in kitchen, or even the table in the living room when the game was on. The house was well stocked, and the owner is very quick to respond if you can't find something. The house is not located right on the beach or ski resort, but they are a close enough drive, and the house is in a nice/quiet neighborhood. We will definitely look to stay here again in the future.